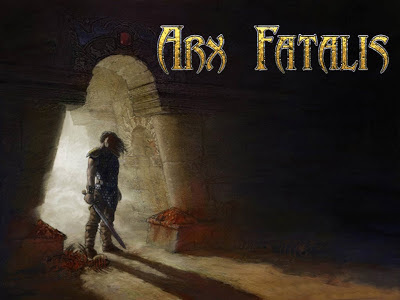 Arx Fatalis is one of my favorite games of all times. I don’t say that lightly. I used to be way more forgiving when it came to video games, but in the last years I have become more selective with games since I have less time to devout to gaming. I played this game around 2007, I’m not sure. By then the game was already a couple of years old. I read about it in a magazine but forgot about it, until my cousin borrowed it to me when he got it from another magazine years later. He said that I would probably like it and he was right. I played this before Morrowind and even though Morrowind is an awesome game Arx Fatalis is better in many aspects the direct competitor. 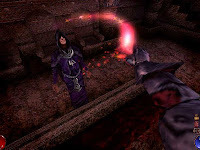 Both were released in 2002, but Morrowind stole the thunder of Arx Fatalis and the game fell into obscurity, a rumored sequel never became reality. Another gaming gem that got forgotten, oh well. This First Person Action RPG was developed by Arkane Studios (who weirdly got acquired by Zeni Max Media the same guys that worked on Morrowind) who have recently developed Dishonored. All they’re games are first person and Action based in some way, and it all started for them with Arx Fatalis. It’s always interesting to play the first game of a developer. Usually those games have alota heart and are somewhat rough around the edges, but have a certain kind of charm. I can’t explain it but Arx Fatalis has it. The game follows in the long tradition of as already mentioned first person action role-playing game that "Ultima Underworld" started and is continued to this day by the "Elder Scrolls" series. Even though the game is a medieval fantasy game, the world is unique and quirky enough to set it apart from all the other virtual fantasy realms out there. It started out as a more or less typical medieval high-fantasy world, but with some big differences. There are no Elves in the game, none at all. That is very refreshing, since I have gotten somewhat sick of the immortal girly men of fantasy. Goblins, trolls, dwarfs and off course humans are the most common races in this world. There are also Naga like Snake Women that wield great knowledge and magic and are the closest thing to elves in this game. There are also Dragons. In the game they are alluded too and you can interact or fight one, which is neat but on that later. Other than the races there is another big difference in this world. At one point in time, the sun disappeared and all races fled to caves which were mostly dug by the dwarves. 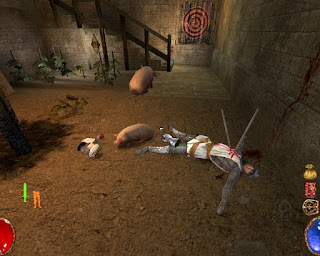 This gave the developers a great way of limiting the gamespace in a natural way and making a unique gameworld. You’ll see towns that are underground, and the only light are usually torches and fluorescent mushrooms. It even explains that the snakewoman helped the humans, and used magick on their crops so they could grow underground with no light. I like these kinds of details, which shows a dedicated team of game designers. The game begins in a jail, similar to how some other RPG’s start like the Elder Scroll games. You don’t know who you are and start you’re adventure. This plot device might be somewhat clichéd and overused, but it is really cool here. You’ll talk there with a weird inmate, who will help you escape. At first you need to escape the Goblin Prison and survive. I remember fighting with my fist on the beginning before I got a bone. And I remember the bone broke after only a few smashed but it did help me, and soon I would get better weapons. Once you get to the Human settlement, it plays more like a traditional Action RPG. You get quests fulfill them get XP, level up, and get better loot. It’s standard but works well, and first person combat is fun. 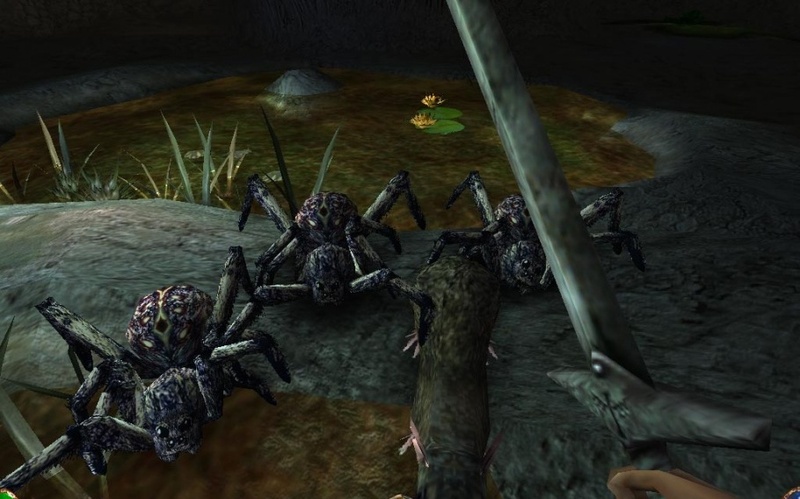 Even though I like Morrowind a lot I prefer the gorier more visceral combat of arx. The quests are intriguing and can be solved in multiple ways (including the main quest). The Magic system is quite unique. Instead of simply learning new spells you would find runes. Then you needed to literally write the runes with your mouse (kinda like in Black & White) and see if that combination would have an effect. Weaker spells would require one rune, more powerful more. 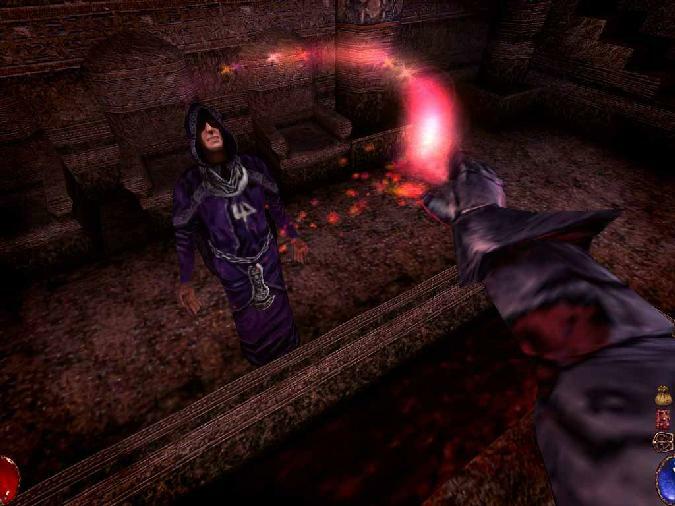 It can be quite challenging trying to write a protection or fireball spell (which can take 2 to 3 runes to be written) while fighting a deadly Lich, (much more badass then in Oblivion or Morrowind) but that what makes the fun and the challenge. Also in many RPG’s the hero must acquire a mystical weapon in order to defeat the big Bad in the end. Arx is no exception in that, but you don’t find the mystical Excalibur like sword, you have to make it. I really liked that, and it took a long while and involved getting the book that explains how such an awesome weapon could be made. Getting each material alone was each a worthy Quest (A super rare Mineral, a Dragons egg and a meteorite) but you needed to have the right spell to in order to finish it. That was one of my favorite touches in an RPG ever. There are many other great elements but I don’t want to spoil everything, so go over to GOG and try it out. Anyway try this game if you like fantasy or RPGs you won’t regret it! get the game from GOG here.